Georgetown is a very special place. A huge natural harbour bounded by islands making a safe anchorage in any winds for several hundred yachts, hundreds of miles from any major civilization. Two natural "hurricane holes" exist there too. An AM radio or TV would pick up absolutely nothing. The small Bahamian town of Georgetown was just big enough for a small airport so a good place for friends to visit you, and it had a good supermarket and some great places for dinner. 300 hundred or so cruising yachts from all over the world would stay there for the months of Feb-Apr. Barbecues were held every night on any one of dozens of great beaches. Volleyball was played at 4:00 PM every day. Dinghy races were held, treasure hunts organised, slope soaring competitions held with radio controlled sailplanes along a bluff (it is amazing what people carry on their sailboats.) It took most of the three months just to get to know everyone there. One anchoring area became "reserved" for all the cruising boats which had children and the kids had a field day playing with each other, they even had their own "reserved" UHF channel and often chatted in code so their parents did not know what was going on, or so they thought. The kids would usually study from 8:00 am till noon each day. I was once anchored beside a yacht which had this super cute 8-9 year old girl aboard. 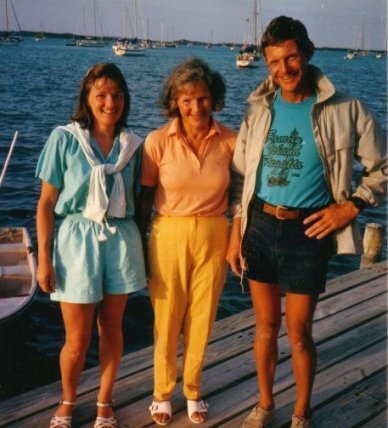 Early each morning she would use the jib pole and a halyard connected to a mast winch as a crane to lower her Windsurfer from the deck to the water. Then she would climb down the rope herself to the sailboard, haul the Windsurfer sail out of the water, click in her harness, and zoom off like an accomplished pro! Weeks later I had my Mum visit from Ireland and sister, Carol, from Utah. Georgetown is a great place to pick up visitors as it has a well served airport. My sister got to fly in the co-pilots seat as hers was a small plane needing just one pilot. We all had a great time in Georgetown as there are some reasonable shops, groceries, and most importantly, some nice restaurants. The swimming is fantastic as there are so many beautiful empty beaches around. Social life is active as barbecues are organised frequently by other boaters on the various beaches. My Mum and sister said afterward it was the best vacation they ever had. 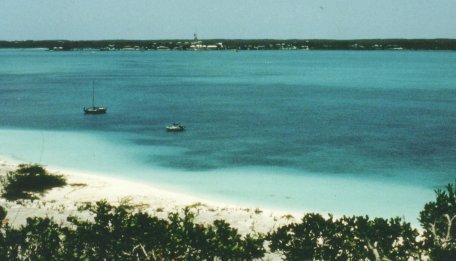 A few well traveled sailors told me the most fantastic reefs in the Caribbean are west of an island call Conception Island which lies on the way to the Turks and Caicos. I heard stories of Stag Horn coral 40' tall!! This was something I had to see. 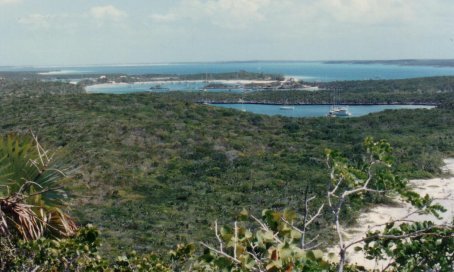 In perfect weather, my sister, Mum and I set off from Long Island at the bottom of the Exumas and sailed the long trip to the tiny island. Finally, after sailing for two days, we came upon the crescent moon shaped island. 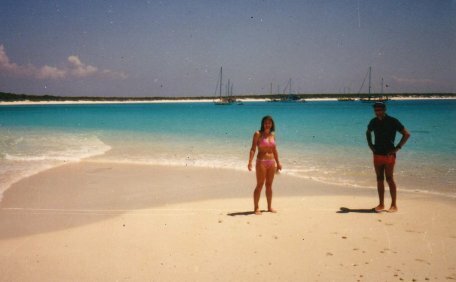 The beach had the most beautiful clean sand I had ever experienced - even among the hundreds of beautiful beaches in the Exumas. A trip out to the reefs, which stretch for several miles, posed a problem. Where to drop the anchor? Vast stag horns covered the whole area. I finally found a small patch of sand and dropped an anchor. I quickly realized there was a strong current flowing which led, later, to a very tricky situation (see "Situations"). Jumping overboard with a weight-belt I soon was immersed in the incredible forest of Stag coral below. The water was crystal clear and deep (45'). I swam down 20' or so and marveled at the massive trunks of the Stag Horns. The current, and the incredible density of the intertwining coral branches, made it a place to be careful. I stayed close to the anchor chain and sand patch where there was enough space to dive down. It truly was an awesome sight.